(COCHISE, AZ) In the world of generation, timing can be critical – especially when it comes to summer temperatures and soaring demand for power. That’s why it’s a good thing the service bulletin about possible issues with GT4 at Apache Generating Station came out in early 2017, giving the Arizona G&T Cooperatives engineering team time to get ready for what turned out to be a major turbine rebuild. “GE (General Electric) as the original manufacturer put out a service bulletin early this year recommending the replacement of stages three, four, and five, of the high-pressure compressor,” said Nathen Hatch, generation engineering manager. GE contractors Joshua Ray (left) and Fernando Alers (right) work to keep GT4 ready for what could be a demanding summer. “The reason they wanted these three stages replaced was due to the attachment hardware that holds the blades onto the rotating shaft; over time there’s been fatigue where they’ve had failures” where the blades would come loose, causing major damage to the rest of the turbine, Hatch said. “The compressor section is rotating around 10,500 rpm’s, so if one of those blades comes out while it’s running, you don’t want that,” Hatch said, adding that if enough blades came loose at that speed, it could destroy the unit. Once it was determined the service bulletin applied to this particular model turbine, the work began. 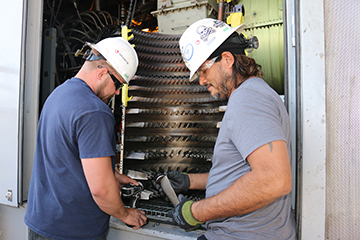 GE contractors Joshua Ray (front) and Fernando Alers replace variable stator vane bushings to keep each of the vanes snug in the compressor case. “When we got in there we found the attachment hardware (on the turbine blades) had not yielded. It was still in decent condition,” Hatch said. Because demand this summer is forecast to be higher than in previous years, Hatch said it’s a good thing the service bulletin was issued early in the year. “GT4 is primarily a peaking resource, one that we put on during periods of high pricing or high load demand. Typically it equates to high temperatures in the peak part of the day,” Hatch said. 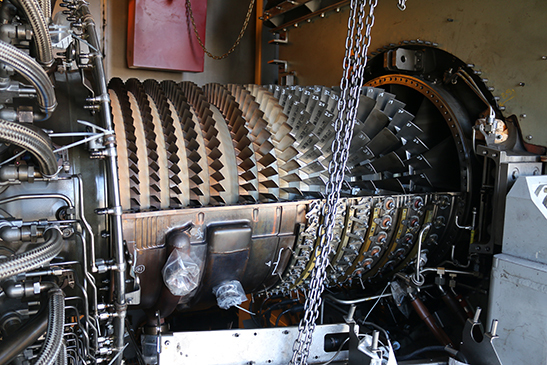 Work has also been completed on the blades connected to the high pressure section of the compressor. “In the past it’s been called upon during the summer pretty much daily during period of high load, and we expect that this year. In fact, planning is saying it may have a higher capacity than it’s seen in previous years,” Hatch said. Hatch said expected demand means Apache Generating Station is going to be a busy place this summer. “As we get closer and closer to summer we’ll need more and more load,” Hatch said. 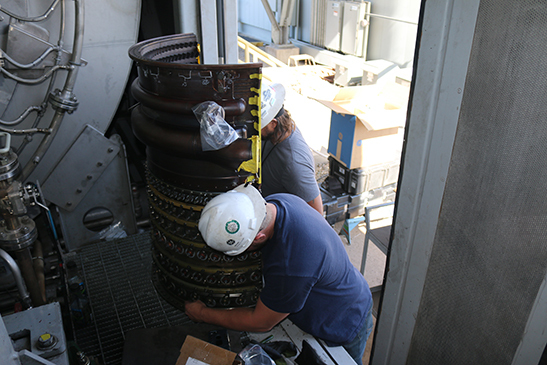 Not only did they accomplish the rebuild on the three stages as recommended by GE, they were able to perform normal, scheduled maintenance on the first stage of the compressor, a task that was coming due anyway. 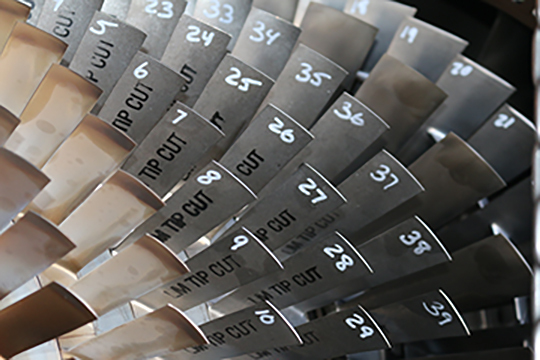 The numbers on each blade help the crew keep this section balanced, similar to balancing a tire. The rebuild took two weeks to complete and GT4 was back in service in early May, Hatch said. “This was one of the first projects that Justin Covington, our new turbine engineer, took on, and he did a good job on it,” Hatch said. “Since the unit has come back online, the preliminary data shows that the heat rate has improved” bringing the unit back to factory specifications, Hatch said. This entry was posted in Articles, Blog, News. Bookmark the permalink.